Height & Weight: 5’11” 155 lbs. Height & Weight: 5’10” 215 lbs. Hello all. Just a quick update on recruiting before commitmas day arrives. Coach Hoke and crew should be commended for the excellent job they have done over their first three weeks on the job. They’ve picked up seven commits since January 11th, six of which were new on the recruiting board. Developing those relationships that quickly illustrates how good these guys are at recruiting. Of course having Greg Mattison is a plus! Hoke also solidified commitments from Tony Posada, Blake Countess and Kellen Jones. On to the next few days. 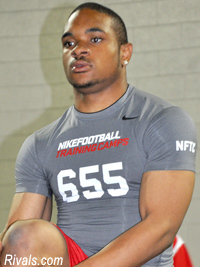 Michigan is still in on a number of prospects as the 2011 recruiting season nears its end. Thomas Rawls, Jake Fisher, Frank Clark, Leilon Willinghan, Darian Cooper and Chris Barnett are all still considering the Wolverines and will be making their decisions in the next 48 hours. I believe we have a good shot at all of them, but some more so than others. 1. Thomas Rawls. 99% chance he’s a Wolverine. This is no surprise to anyone that follows recruiting. Thomas is a lifelong Michigan fan and finally received his offer this past weekend. Rawls decides tomorrow at 1:30 PM between Central Michigan and Michigan. 2. Frank Clark. 99% chance he’s a Wolverine. But he’s from Cleveland Glenville?!?! Yup. And coach Ginn is a big Brady Hoke fan. This is a nice foot in the door at a football factory. Frank and the other Tarblooders will decide on Wednesday. His top schools are Michigan, Michigan State and North Carolina. 3. Leilon Willingham. 80% chance he’s a Wolverine. Leilon is a new recruit and visited a few weekends ago. Coach Mattison made a great impression and vaulted the Wolverines near the top of his list. Willingham will decide on Wednesday between Arizona State, Central Florida, Colorado, Michigan and Washington. 4. Darian Cooper. 51% chance he’s a Wolverine. Dropped Michigan from consideration after RR was fired, but put us back on his list after a visit from coaches Hoke and Mattison. He visited this past weekend and really enjoyed himself. Cooper is a HUGE need and would be an awesome get. Darian will be choosing between Georgia Tech, Iowa, Michigan and Michigan State on signing day. I think he’ll be Blue, but watch Iowa here as well. 5. Chris Barnett. 50% chance he’s a Wolverine. Another new kid at a position of great need. Barnett recently visited and enjoyed it as well. He is currently a “soft” verbal to Arkansas. Here’s the issue, Arkansas already has three tight ends in the fold other than Barnett and a ridiculous 29 verbals already. Chris will make his choice on Saturday after all of the dust has settled in Hog country. 6. Jake Fisher. 50% chance he’s a Wolverine. Jake verballed to Michigan months ago, but got a wandering eye after coach Rod was canned. He visited Oregon this past weekend, so we’ll see what happens. I just don’t have a gut here. If someone put a gun to my head, I’d say it’s the Ducks. I for one hope he stays closer to home and picks up the Michigan hat for the second time on Wednesday morning. There you have it boys and girls. We’ll have more for you in the coming days. Then it’s on to 2012!! Height & Weight: 6’3” 185 lbs.